In the beginning was the Word, and the Word was with God; and the Word was God. He was in the beginning with God. All things were made through Him, and without Him was made nothing that was made. In Him was life, and the life was the light of men…. …He was in the world, and the world was made through Him, and the world knew Him not. He came into His own, and His own recieved Him not. Immediately after the Last Blessing the priest goes to the Gospel side of the altar. There he says, “Dominus vobiscum,” and makes the Sign of the Cross on the altar, and then on his forehead, lips, and breast. This is just as he did at the first Gospel. As we make the Sign of the Cross on our forehead, lips, and breast, we can have the same thoughts as we did before the first Gospel. We want our minds to know about Our Lord and His teachings. We want our voices and tongues to make them known. We want our hearts to love them. We know we prove our love for the teachings of Our Lord by putting them into practice in our everyday life. On most days, the Last Gospel is the same. It is the first fourteen verses of the Holy Gospel written by St. John. Parts of the Last Gospel are given at the beginning of this lesson. Sometimes there is a special Last Gospel. You can tell when this special Last Gospel is being read. 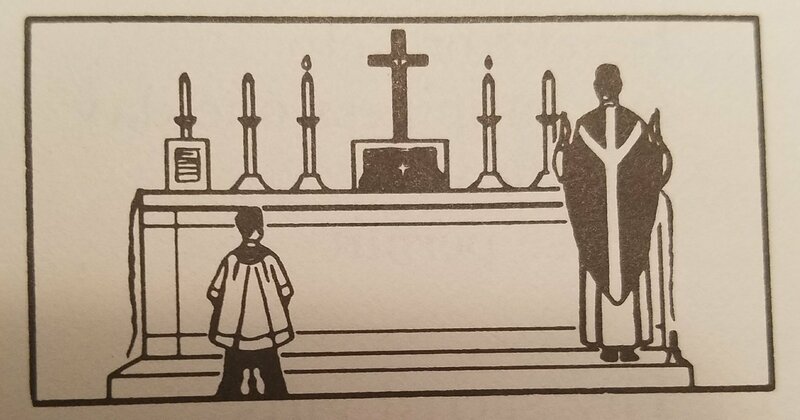 The altar boy moves the Missal from the Epistle to the Gospel side of the altar. 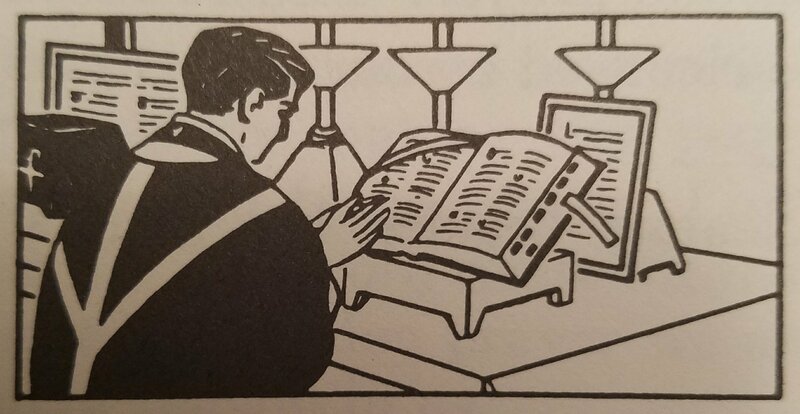 The priest always reads a special Last Gospel from the Missal . The first fourteen verses of the Gospel of St. John are printed on the card on the Gospel side of the altar. In the Holy Sacrifice of the Mass Our Lord Jesus Christ, Who is God, has been made flesh again. The dismissal is next given. The priest, still facing the people, says: “Go, the Mass is over.” Sometimes the Latin is put into other English words – “Go, you are sent forth.” or “Go, you are dismissed.” The altar boy replies: “Thanks be to God.” In the name of the people he is thanking God for the graces they have recieved during the Holy Sacrifice of the Mass. May the tribute of my worship be pleasing to Thee, most Holy Trinity, and grant that the sacrifice which I, all unworthy, have offered in the presence of Thy majesty, may be acceptable to Thee, and through Thy mercy obtain forgiveness for me and all for whom I have offered it. This prayer speaks of some things about Holy Mass that Catholics desire always to remember. The Mass is, first of all, an act of worship of the Most Holy Trinity. An act of worship tries to give to God the honor that is due Him. 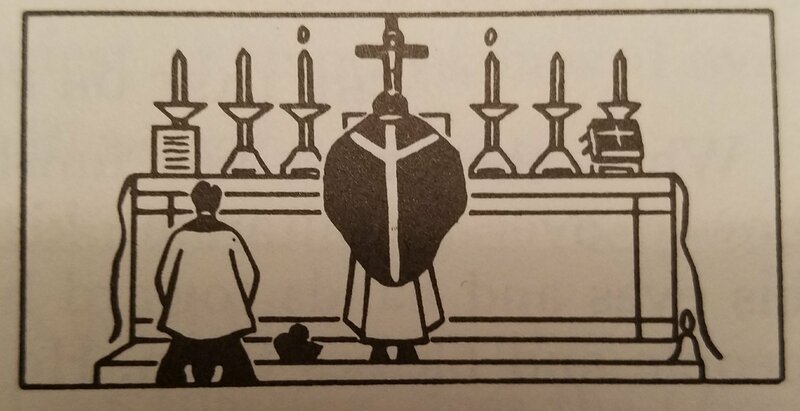 Holy Mass is a sacrifice. The Holy Sacrifice of the Mass is the all-perfect sacrifice. In the Mass Our Lord Jesus Christ, through the priest, offers Himself to God under the appearances of bread and wine. The priest is speaking for himself. He says how unworthy he is to have offered the Holy Sacrifice. The words of the priest remind the people to have the same thought. They know how unworthy they are to unite with the priest in offering the Holy Sacrifice of the Mass. They know how poorly they have done so. The priest asks for forgiveness for himself, and for all those for whom he has offered the Holy Sacrifice. Many times during Holy Mass the priest and people pray for two things. The first is forgiveness or pardon. The second, not mentioned in this prayer, is God’s grace and help. Priest and people pray for these blessings for themselves and for others. 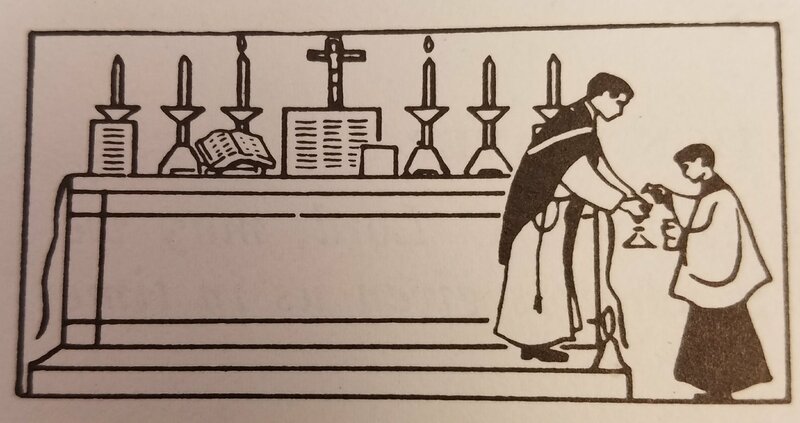 When the priest has finished the prayer that he says bowed over the altar, he kisses the altar. Then he raises his eyes and hands toward heaven. Next, he turns to the people and blesses them. He makes the Sign of the Cross and says: May God almighty bless you: the Father, the Son, and the Holy Ghost. The altar boy answers, Amen. The words of blessing seem to speak to the people of two things. First, they remind them of the blessings received from the Most Holy Trinity during Holy Mass. Then they seem to tell the people that they have new grace. They have help from God for all they shall do and think and say, as they go forth from Holy Mass. Having recieved Thy sacred gifts, O Lord, vouchsafe the more often we frequent these mysteries, the more surely they may avail to our salvation. 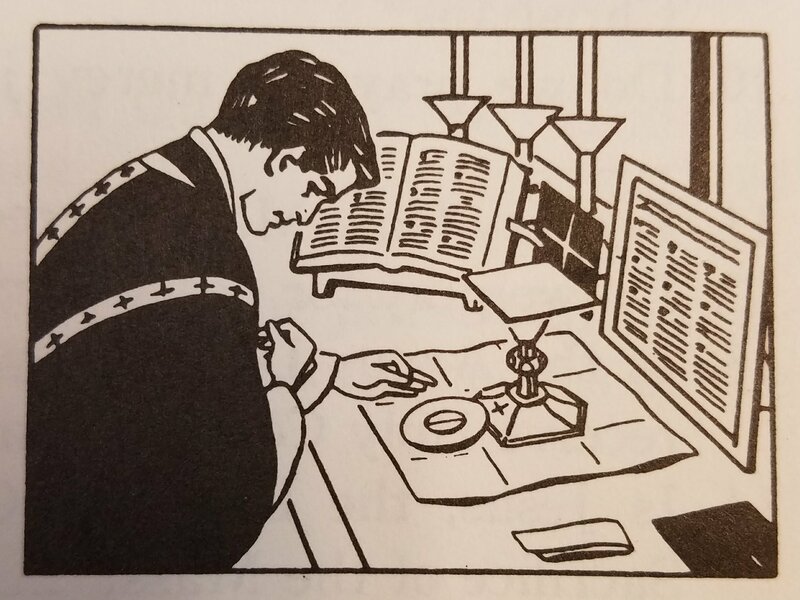 After he reads the Communion verse, the priest goes back to the center of the altar. He kisses the altar and turns to the people. He says to them in Latin, “The Lord be with you.” The altar boy answers for the people, “And with your spirit.” This greeting of the priest is always a reminder or invitation. He desires them to join with him in the prayer or prayers that follow. At this time the priest wants the people to pray the Postcommunion prayer or prayers with him. The Postcommunion is part of the Proper of the Mass. It changes from day to day. Often the Postcommunion speaks of the feast of the day. 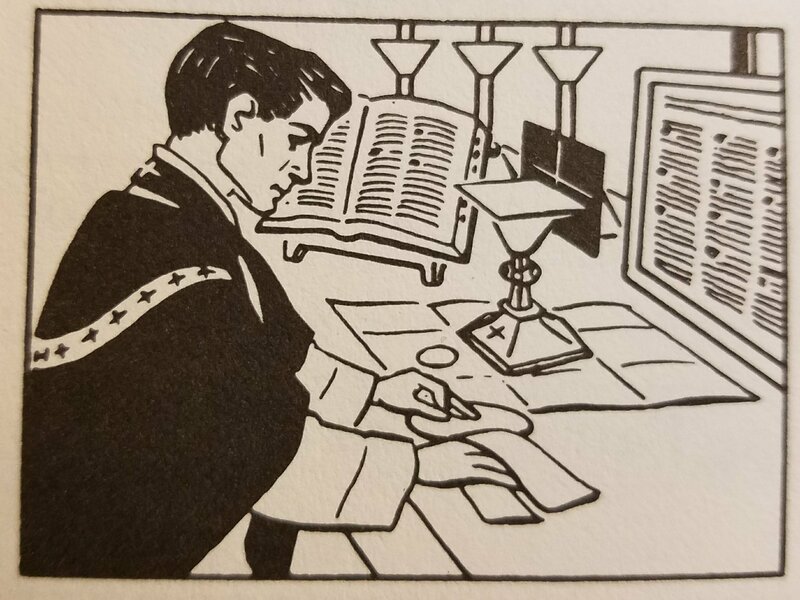 It is made up of one or more prayers that the priest reads from the Missal. 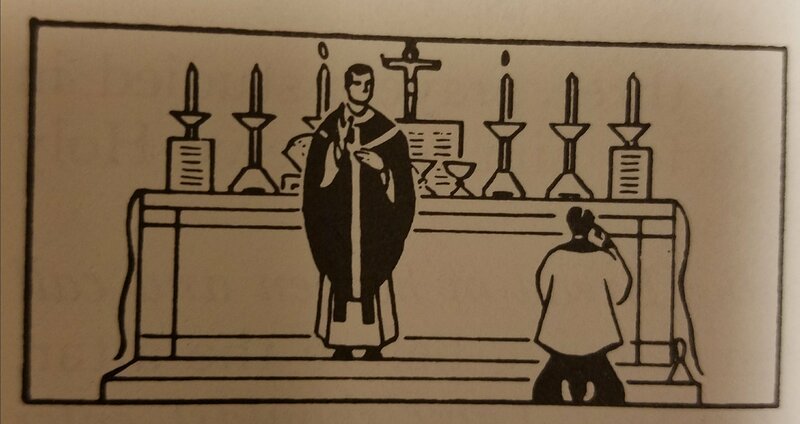 The priest is at the Epistle side of the altar as he prays the Postcommunion. Almost always the Postcommunion prayers speak of Holy Communion that has just been received. These prayers ask God that the graces of Holy Communion may help us to live good lives. The ablutions, Communion, and Postcommunion are the prayers the Church uses in thanksgiving for Holy Communion. We bless the God of heaven, and before all living we will promise Him; because He has shown His mercy to us. The Communion Verse is part of the Proper of the Mass. It changes from day to day. The priest reads the Communion verse from the Missal. The Missal is on the Epistle side of the altar. The Communion verse is read after the Ablutions. This verse is a short prayer. Once it was part of a Psalm. The Psalm waa sung by the choir and people, as the people went to receive Holy Communion. The Communion verse at the beginning of this lesson is a short prayer of praise. It gives one a beautiful thought to have after Holy Communion. What has passed our lips as food, O Lord, may we possess in purity of heart, that what is given us in time be our healing for eternity. May Thy Body, O Lord, which I have eaten, and Thy Blood, which I have drunk, cleave unto my very soul, and grant that no trace of sin be found in me, whom these pure and holy mysteries have renewed. Who livest and reignest world without end. Amen. The word ablution means cleansing or washing. During the ablution prayers the priest cleanses the chalice. He does so that nothing may remain in it of the Precious Blood of Our Lord. His fingers, too, are cleansed, for they have touched the Sacred Host. The ablutions take place immediately after the people have received Holy Communion. 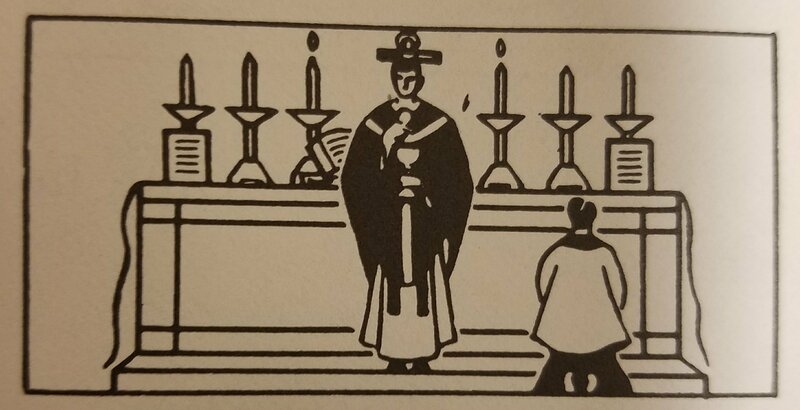 The priest is standing at the center of the altar as wine is poured into the chalice. 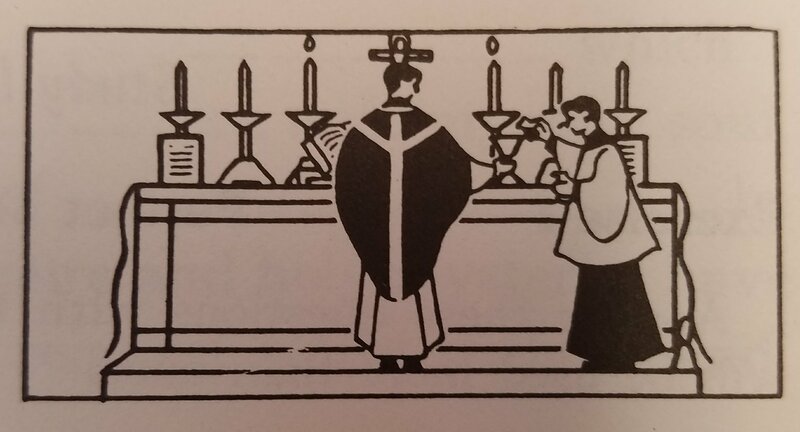 First, he rinses the chalice with the wine. As he does so he makes the first ablution prayer. This prayer is very short, but it means a great deal. It says that we received Holy Communion as food: in the words of the prayer, it “passed our lips as food.” Then the prayer asks that our hearts may be pure. This means, may they be cleansed from sin. It also asks that the Holy Communion we have just received may help us now that we may be happy forever in heaven. When the priest has finished the first ablution prayer, he drinks the wine that was used to rinse out the chalice. Then the priest goes to the Epistle side of the altar. There the altar boy pours wine and water over his fingers. As the water and wine are poured, the priest prays the second ablution prayer. In this prayer we also ask that the blessings of our Holy Communion may remain with us always. Priest and people are making this request when they pray that the body and blood of Our Lord may “cleave unto my very soul.” The word cleave means stick to it or cling to it. In this second ablution prayer we ask that not even a stain of sin may remain in us. After the second ablution, the priest returns to the center of the altar. He wipes his fingers with the purificator and drinks the water and wine. 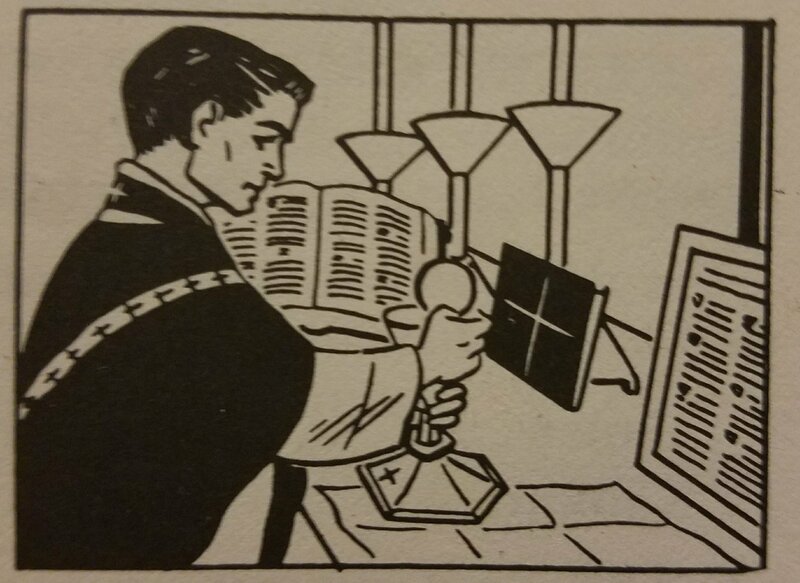 He dries his lips, and then cleans the chalice with the purificator. When he has done these things, he arranges the chalice as it was at the beginning of Mass. The last thing he does is to place the chalice veil over it. 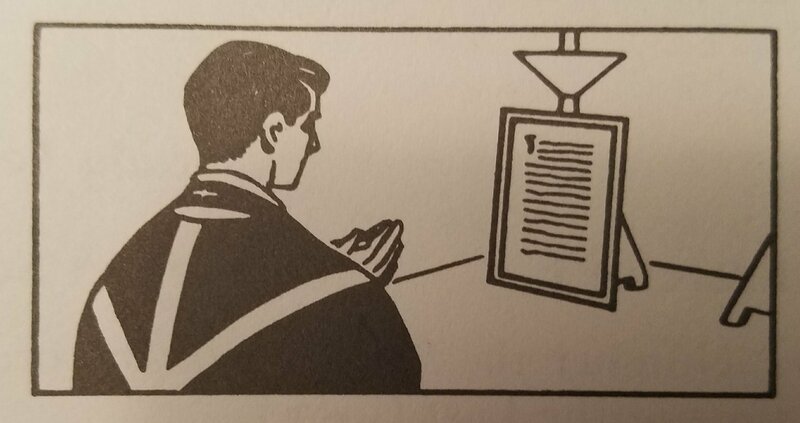 After the priest has made the three prayers studied in the last lesson, it is almost time for him to recieve Holy Communion. But first he says: I will take the Bread of heaven and call upon the name of the Lord. 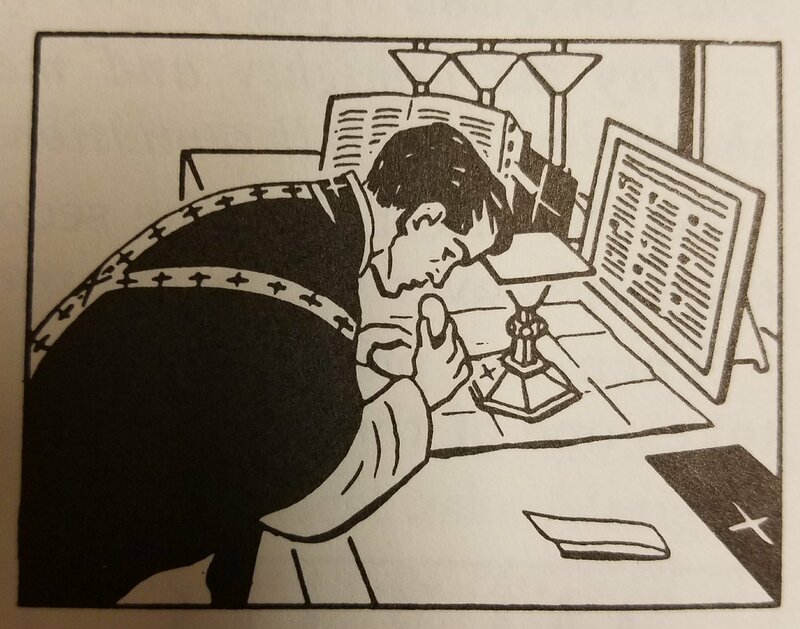 Then, bowing before the altar, he prays: Lord, I am not worthy that Thou shouldst enter under my roof, but only say the word and my soul will be healed. Three times the priest makes this prayer that begins Lord, I am not worthy… Each time he says it he strikes his breast. At this time the altar boy rings the bell three times. The priest next says: May the Body of Our Lord Jesus Christ keep my soul unto life everlasting. Amen. Then he recieves the Sacred Host. For a short time he thinks about the most Holy Sacrament. What return shall I make to the Lord for all He hath given me? I will take the chalice of salvation, and I will call upon the name of the Lord. Praising, I will call upon the Lord, and I shall be saved from my enemies. May the Blood of Our Lord Jesus Christ keep my soul unto life everlasting. Amen. After this prayer the priest receives the Precious Blood of Our Lord. Then he gives Holy Communion to the people. Almost immediately after the bell rings, the people go to the communion rail. At this time, the Confiteor – I confess – is recited by the altar boy in the name of the people. This prayer tells God, our Blessed Mother, and the saints that we have committed sins. We speak of them because we are sorry we committed them. May the almighty and merciful God grant you pardon, absolution, and full remission of your sins. As the priest says the second part, he makes the Sign of the Cross over the people. Behold the Lamb of God, behold Him Who taketh away the sins of the world. And three times he says: Lord, I am not worthy that Thou shouldst come under my roof, but only say the word and my soul shall be healed. St. John the Baptist first said: “Behold the Lamb of God; behold Him Who taketh away the sins of the world.” Our Lord, in the Holy Sacrifice of the Mass, continues to take away the sins of the world. It was the centurion, during the life of Our Lord on earth, who went to Him and said: “I am not worthy to have You enter under my roof.” But the same centurion also said: “Only say the word, and my servant will be healed.” Our Lord was pleased with the faith of the centurion. He cured the servant by saying just a word. Knowing that Our Lord has power to cure and to forgive, we make the centurion’s prayer our prayer, as we get ready to recieve Holy Communion. This is what the priest does as he gives Holy Communion to each person receiving. First, he blesses the person, making the Sign of the Cross with the Sacred Host. Then, as he places the Host on the tongue of the person, he says: May the Body of Our Lord Jesus Christ keep thy soul unto life everlasting. Amen. 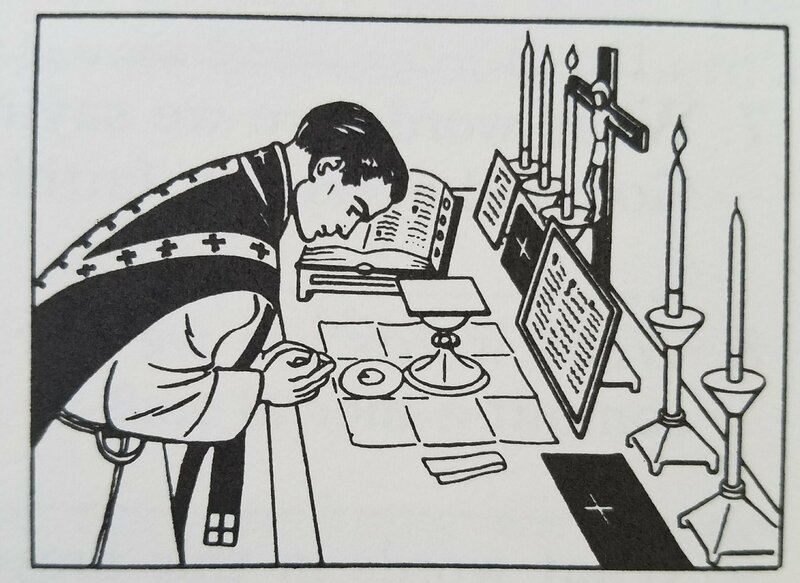 The Three Prayers Before the Priest’s Communion Lesson 4. O Lord Jesus Christ, Who hast said to Thy apostles: Peace I leave with you, My peace I give to you, regard not my sins but the faith of Thy Church, and deign to give her peace and unity according to Thy will. Who livest and reignest, God world without end. Amen. The three prayers before the priest’s Communion are made to Our Lord. It is Our Lord Jesus Christ, the Second Person of the Most Holy Trinity, Whom priest and people will recieve in Holy Communion. These prayers are in preparation for Holy Communion. They are the prayers of the priest offering Holy Mass. In them he uses the words I, my, and me. But they can also be the prayers of the people. In the first of the three prayers, priest and people pray for peace. This is the fourth time they pray for peacein the Communion part of the Mass. The prayer reminds Our Lord of words He spoke to the apostles at the Last Supper. He said to them: “Peace I leave with you, My peace I give to you.” Then the priest asks Our Lord to give peace and unity to the Church. When we pray for peace and unity in the Church, we are praying for oeace and unity among the members of the Church. In Holy Communion, we recieve grace to love God and our neighbor. This is the greatest help to peace and unity. Because people do not love one another, there are wars and other kinds of suffering. Lord Jesus Christ, Son of the living God, Who by the will of the Father, with the cooperation of the Holy Ghost, hast by Thy death given life to the world, deliver me by this Thy most sacred Body and Blood from all my sins and from every evil. Make me always cling to Thy commands, and never permit me to be separated from Thee. Who with the same God the Father and the Holy Ghost, livest and reignest, God world without end. Amen. As the priest says this prayer and the next one, his hands are folded. 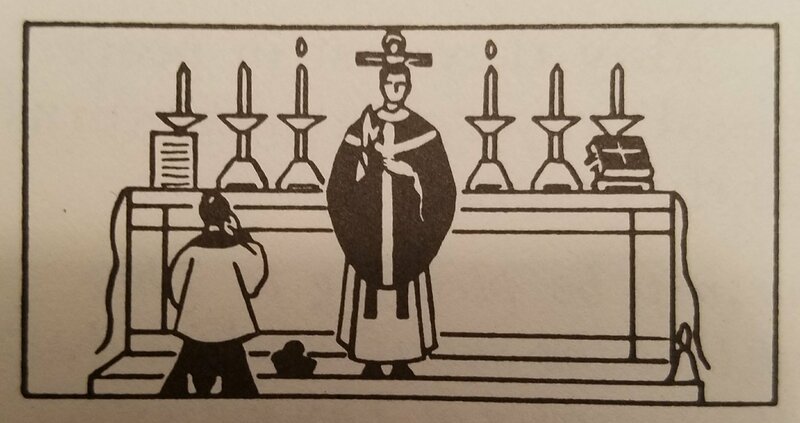 His eyes are on the Sacred Host, and he goes before the altar. He is speaking to Our Lord Whom he will recieve in Holy Communion. The prayer reminds Our Lord that, by His death, He gave life to the world. This is the life of grace that we first recieve in the Sacrament of Baptism. This prayer asks Our Lord for four favors. First, each one praying it asks to be delivered from his or her sins. This means the punishment due to sin. At the same time, priest and people also ask to be delivered from every evil. They ask for these favors because of the body and blood of Our Lord which they are about to recieve. Next, they ask for grace always to keep the commandments. Lastly, they pray never to be separated from Our Lord. Mortal sin alone can separate us from Him. Our prayer is for grace never to commit mortal sin. Let not the partaking of The Body, O Lord Jesus Christ, which I, all unworthy, make bold to recieve, turn to my judgement and condemnation, but by reason of The loving kindness, may it be to me a safeguard of both soul and body, an effective remedy. Who livest and reignest with God the Father in the union of the Holy Ghost, God world without end. Amen. Each one making this prayer asks two other things. Priest and people pray that Holy Communion may protect them and help them, both in body and soul. The prayer says they ask for these favors because of Our Lord’s loving kindness. Lamb of God, Who takest away the sins of the world, grant us peace. After the priest says the prayer beginning, “Deliver us, O Lord, we beseech,” he prays that the peace of the Lord may be always with us. Then there is a short prayer. It asks that all those who recieve Holy Communion may be helped to save their souls and be happy forever in heaven. This prayer is made by the priest as he drops a small piece of the Sacred Host into the chalice. The chalice contains the blood of Our Lord. The prayer that we call “The Agnus Dei” is said next. “Agnus Dei” is the Latin for “Lamb of God.” Three times this prayer uses words spoken by St. John the Baptist. St. John called Our Lord the “Lamb of God” when he pointed Jesus out to the Jews. He was showing Him to them as their Savior. St. John said: “Behold the Lamb of God Who takest away the sins of the world.” He meant that Jesus would give His life for them. The Bible tells us that the Jews offered a lamb to God on their greatest feast of the year. The lamb was the victim of their sacrifice. The lamb was offered to God to make up for sin. The lamb was a sign of Jesus, the Son of God. Jesus alone could make up to God for the sins of men. When the priest says “have mercy on us” and “grant us peace,” he strikes his breast. People strike their breasts as a sign of what they are thinking. They wish to make known to God and to others that they are thinking of their sins. Our Lord is still saving men. In the Mass He continues to offer Himself to God the Father to make up for the sins of men. He is the lamb or victim offered in sacrifice. He is making up for sin and obtaining grace for men. Deliver us, O Lord, we beseech Thee, from all evils, past, present, and to come; and through the intercession of the glorious and blessed Mary, ever virgin, mother of God, together with The blessed apostles, Peter and Paul and Andrew, and all the saints, grant of Thy goodness, peace in our days, that aided by the riches of Thy mercy, we may be always free from sin and safe from all disquiet. The prayer asks that we may be protected from all evils, those of the past, those of the present, those which may come upon us. In the same prayer we also ask for “peace in our days.” Peace comes to us when we keep away from sin and are safe from troubles outside of us. In the Communion part of the Mass the peace is repeated frequently. Sin is the great enemy of peace. On the other hand, love of God and love of neighbor gives peace to families, countries, the whole world. There would be no wars if all men loved God and their neighbor. God’s grace, which we recieve in a special way in Holy Communion, is the greatest help possible to grow in love of God and love of our neighbor. Through Him, and with Him, and in Him, is to Thee, God the Father Almighty, in the union of the Holy Ghost, all honor and glory world without end. Amen. This is the last prayer of the Canon of the Mass. It is a prayer of praise. The Preface, the prayer that introduces the Canon, is also a prayer of praise. The first purpose for which the Holy Sacrifice of the Mass is offered is to give to God the honor that should be given to Him. This short prayer speaks of honor and glory for the Most Holy Trinity. Our Lord’s sacrifice on the cross, which is continued in the Mass, makes it possible for us to give worthy praise to the Most Holy Trinity. The priest holds the Sacred Host in his hands as he says this prayer. With it he makes three crosses over the chalice and two crosses before the chalice. Then he raises both chalice and Host. As he does these things he is saying the last prayer of the Canon of the Mass. The offering part of the Mass ends with this last prayer of the Canon. During the Offertory, priest and people offered bread, wine, and themselves to God. At the Consecration, Our Lord offered Himself to His Father, just as He did at the Last Supper and on the Cross. Immediately after the Consecration, we joined with the priest and offered Our Lord to God the Father.